ลิงก์สำหรับ IOS : คลิกที่นี่ - Have an iPhone or iPad ? Have an Eye-Fi X2 card ? Get the FREE Eye-Fi app to instantly upload from your Eye-Fi X2 card to your iPhone or iPad. Enjoy unlimited photo & videos uploads straight to your iPhone/iPad, anywhere you go. No syncing. No tethering. No hassles. ลิงก์สำหรับ Android : คลิกที่นี่ - Have an Android phone or tablet ? Have an Eye-Fi X2 card ? 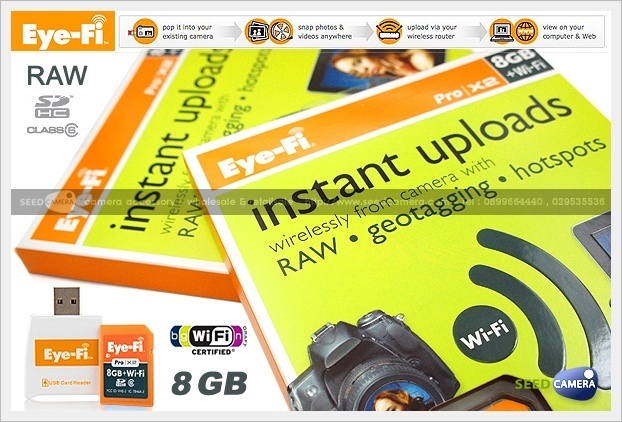 Get the FREE Eye-Fi app to instantly upload from your Eye-Fi X2 card to your Android smartphone or tablet. Enjoy unlimited photo & videos uploads straight to your Android, anywhere you go. No syncing. No tethering. No hassles. Instant uploads directly from your camera to your iPhone, iPad or Android tablet. Plus RAW power and Geotagging. Eye-Fi Pro X2 : the most powerful memory card ever. Class 6 read & write speeds for high performance shooting. The power of 802.11n wireless uploads from your camera to your computer & favorite sharing site. And that’s just the beginning. - 8GB memory. Store up to 4,000 photos or 90mn of video with top-notch Class 6 speed. Works just like with your regular SDHC memory card. Perfect for your compact camera! - Wireless. Upload JPEG photos & videos fast through your home Wi-Fi network thanks to built-in 802.11n speed. - Endless. Get the only card that can free-up space for you after pictures are safely delivered. Never worry about running out of space again. - Automatic back-up. Wirelessly upload JPEG photos and videos to folders of your choice on your computer, or even directly into iPhoto for Macs. - Organized. Photos and videos can automatically land in date-based folders, so memories are organized effortlessly. - Compatible. No need to buy a new camera. Check here to confirm that your camera can be turned into a wireless uploading machine. - Effortless sharing. Wirelessly send your JPEG photos and videos to a popular website. See the complete list you can choose from, which includes Flickr, Facebook, Picasa, MobileMe, and YouTube. - Pick your pics. You can select which photos and videos are uploaded. - Get notified. Get email, Facebook or Twitter alerts when your photos are uploading online. - Quick and sweet. Set up takes just minutes. Uploads photos and videos directly from your camera to your iPhone, iPad or Android device in a snap! Get the only memory cards that can do the work for you: the Eye-Fi X2 cards. With Direct Mode, your Eye-Fi card can send photos and videos directly from your camera to your iPhone, iPad or Android device, anywhere you are. Want to back up your photos on your iPad while traveling? Preview your photos in the middle of a photoshoot? Direct Mode sends photos and videos directly to your iPhone, iPad or Android device, wherever you are. Store up to 4,000 photos or 3h of video with 8GB SDHC capacity supercharged with class 6 read & write speeds. Ideal for high megapixel cameras. Upload photos & videos from your camera through your Wi-Fi network with unprecedented wireless performance thanks to built-in 802.11n technology. Wirelessly upload RAW photos to any folder on your computer to streamline your workflow. Always running out of space? With Endless Memory Mode, your Eye-Fi card will automatically free up space once your photos and videos have been safely delivered. Wirelessly upload photos and videos to folders of your choice on your computer, or even directly into iPhoto for Macs. No need to buy a new camera. Check here to see if your camera can be turned into a wireless uploading machine. Upload on-the-go through one of tens of thousands of AT&T Wi-Fi HotSpots, including Starbucks, hotels, restaurants and more. Lifetime, automatic Geotagging service helps you organize and share photos. View, search and share the JPEG photos of your latest trips on a map. Wirelessly send your JPEG photos and videos to a popular website. See the complete list you can choose from, which includes Flickr, Facebook, Picasa, MobileMe, and YouTube. You can select which photos and videos upload from your camera. Photos and videos can automatically be stored in date-based folders, so memories are organized effortlessly by date. Get email, Facebook, text message* or Twitter alerts when your photos are uploading online. - An SDHC compatible camera. The Eye-Fi Pro X2 card works in hundreds of cameras, including Canon, Nikon, Casio, Panasonic and more. Not sure if yours is one of them? Find out here. - A Wi-Fi router compatible with 802.11b/g/n on the 2.4GHz band. Note: 5 GHz band is not supported.